Kristi Kozel of British Columbia, Canada suggested to her son that since he receives many gifts from his family for his birthday, it might be nice for him to help other kids that don’t even get the basics in life. Instead of receiving a bunch of gifts from his friends at his party, he could request a donation that would really make a difference for children in need! He agreed. Kristi gave Trevan three charities to choose from for the donations to benefit. Trevan chose MannaRelief and the Spare Change for Real Change campaign. Trevan liked the idea that just $0.16 a day could really make a difference. 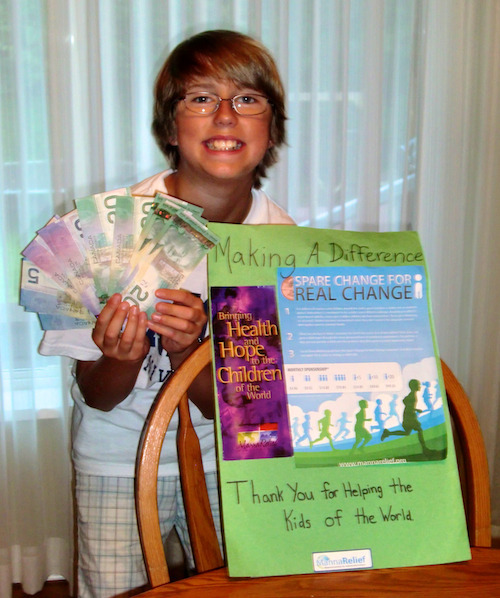 For his 11th birthday, Trevan raised $160 (CAD) that will provide 834 servings of nutritional support to children in need! Trevan with the money he raised and the sign he posted at the party. Thank you, Trevan, for making a difference in children’s lives! We hope your actions will inspire others to make a difference in the world as well!